While I was home over the holidays, we got together with some friends and butchered a number of chickens -- hens who'd stopped laying, roosters with asthma, roosters in general. Nobody else was particularly interested in the organs and feet, so I took those. Gracious. Those old roosters grew dragon's hide on their feet! I dunked the feet in boiling water for five minutes, clipped off the toenails, and then my mother and I painstakingly peeled off the outer layer of scaly skin before making stock of them. That dragon stock was gorgeous. You could have walked on it and not fallen in. But this is about the gizzards and hearts. Gizzards and hearts are delicious dark, dark meat -- almost blue, they're so dark -- but they take a little stewing to become tender. 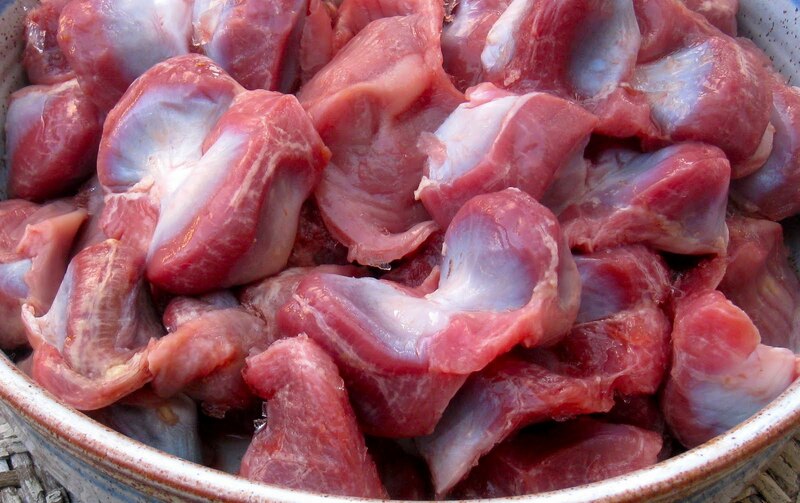 The gizzard is a powerful disc-shaped muscle in the chicken's neck, which grinds seeds and grass. To get the partially digested food out of the gizzard, you have to split it open and peel the lining out, which is why gizzards have that clam-shell shape when you buy them. When considering what to do with my bucket of gizzards and hearts (besides make an enormous pot of gravy), I recalled a delicious dish of zúza paprikás, a.k.a. gizzard paprikash, I had one evening in Budapest. 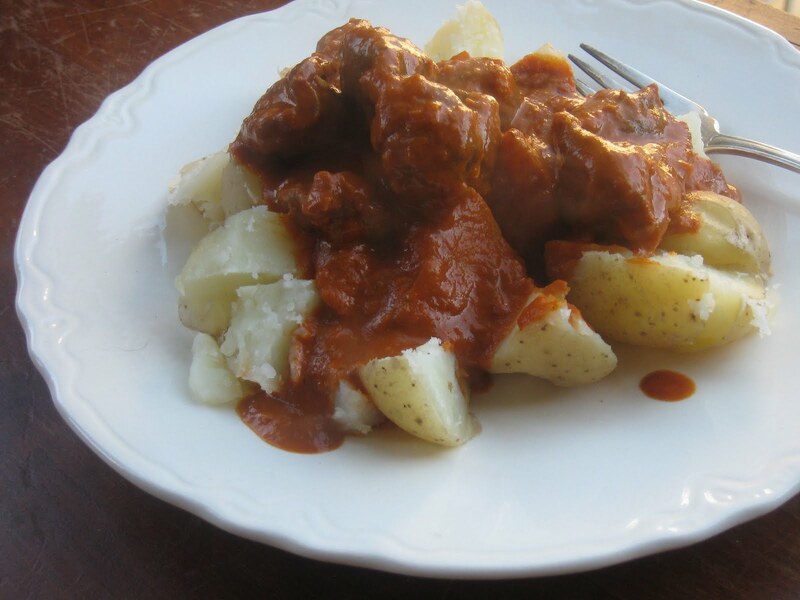 And I recalled a page or two I'd spent an entire day translating from a Hungarian cookbook, and from these two recollections I made a very delicious, convincing gizzard/heart paprikash for supper. It was boldly orange, piquant and creamy. Back in San Francisco, I wanted to compare my recipe to that in a book of mine called Cooking with Love and Paprika, a 1966 cookbook by Joseph Pasternak. To my alarm, he makes a distinction between Hungarian paprikash and Transylvanian paprikash; according to him, my recipe is Transylvanian because it includes sour cream. How perplexing. Well, the zúza paprikás I had in Hungary most definitely had sour cream in it, just like practically everything I ate there (oh sigh!). Also, a good bit of Transylvania used to belong to Hungary, so maybe it's a moot point. Many Hungarian dishes start with rendering some minced smoked pork fat in a skillet. Unfortunately, I cannot walk two blocks to the nearest market hall and ask for a kilo of smoked Mangalica fat from the butcher. (Nor can I ask for a kilo of goose gizzards, or a quart of pickled peppers ladled from the brine vat, or get my jug filled up with raw milk for a handful of forints -- sigh, sigh, and sigh.) So I would recommend frying a few slices of bacon at a fairly low temperature for a long time, so the fat renders out without burning at all. Pour the clean fat into a jar, eat the bacon, and clean the sticky stuff off the skillet before putting the fat back in. This will give you good fat with a nice smoky flavor. You may chop the gizzards or hearts before cooking them; when cooked, a whole gizzard tends to be a bit more than one mouthful. You can also remove the "hinge" in the middle of the gizzard -- this is the most sinewy part -- and then the gizzards will become tender much sooner. I lazily left my gizzards whole. Mince a large onion fairly fine, and let it cook in the fat in Dutch oven till soft and clear. Push the onions to one side of the Dutch oven and briefly brown about a pound of gizzards and/or hearts on the other side. Add salt and a large peeled, crushed tomato (or a tablespoon of paste), and a ton of fresh sweet paprika, 2-3 tablespoons. * Pour in enough chicken stock** to cover the gizzards, cover the pan, and let it simmer for about three hours, until the meat is tender. Undercooked gizzards are unpleasantly squeaky on the tooth. If you trimmed the gizzards, they may only take an hour or so to cook. If the dish seems too liquid (soupy, not stewy), remove the lid and let it boil down for a bit. When it's done cooking, add a couple of cloves of finely minced garlic and turn off the heat. Swirl in sour cream or creme fraiche to taste -- at least half a cup. Taste and adjust the seasonings. Paprikash is traditionally served over little egg noodles (tojásos tészta). As you can see in the picture above, I sometimes enjoy it on potatoes. You can also use this recipe to make straight-up chicken paprikash. Break a small young chicken down into drumsticks, thighs, wings and breasts. It will only need 45 minutes or so of cooking time, and you can let the chicken pieces make their own stock as they cook. Add the breasts towards the end of the cooking time so they don't get overdone. Old stewing birds will take about three hours, just like the gizzards. *About the paprika: it really needs to be good if you're not just sprinkling it on deviled eggs for pretty. Fresh means less than a year old. Sweet means it's made from sweet peppers, not spicy ones. It's hard to find non-sweet paprika in the United States, so you probably don't need to worry about it. **You probably expect me to say "or water" here. But I won't do it. If you were making a custard that called for milk, would you use water instead? Only a very slight exaggeration. Vegetable stock also doesn't work. Neither does most of the "chicken broth" you can buy in stores. Unless the stock is made from bones and tendons, there will not be gelatin in it, and gelatin is necessary for that silky feeling on your lips. And that silky feeling on your lips is necessary for happiness. Okay, fine, you can use water if you're really in a pinch, but don't make a habit of it. Also, if you've gone to the trouble of tracking down chicken gizzards, you're probably in close proximity to some chicken backs or feet, too. Just simmer them for a few hours before you make supper. I love this. Your next book should be "Whole Animal Cooking". We used your recipe for rabbit and it was VERY delicious. That looks absolutely lush. Are you suse you can't pop down to the market for some smoked fat in your neighborhood? I love the dragon broth idea. I made a stock with ducks feet recently. Talk about gelatinous! OH! Thank you, I was wondering how to make stock from the feet. Last time I tried it didn't seem to add any body to the broth-- I suppose it's because I didn't peel them? We ate hearts, livers, and gizzards tonight. Here in Japan they are especially popular with females at the izakaya. Just received your book in the mail today and have already read 1/2 way through...I love it!!! Your blog was listed in the back so I looked it up and of all things to be posted was a recipe for gizzards and hearts. We live on a farm and process our own birds a couple times a year so I have a bag of gizzards and one of hearts in the freezer (next to the chicken feet) from this past fall. I just came across them the other day and was wondering how I should cook them. I've fried the gizzards before but have only used the hearts in a cornbread dressing recipe of my mom's. My husband loves gizzards but I haven't quite developed a taste for them--I'm thinking it's the way I'm cooking them--they're too tough and chewy. Anyway, I'm anxious to try your recipe. Are you Hungarian? I've been looking for some traditional recipes and also somewhere to buy paprika like they would use in Hungary, not this crap in the can.... any tips? Thanks! @Lorie -- No, I'm not Hungarian! I spent six months studying math in Budapest a few years ago and became pretty enamored with Hungarian cuisine. I've found good Hungarian paprika in bulk at the co-op near me, but you could also order it from Penzeys. I don't have a Twitter account and couldn't find an e-mail address for you, so I hope this reaches you! I'm in Budapest right now trying this out. Looking good! chicken stock or water or canned tomatoes. Poured over basic flour dumplings, salt and pepper to taste. Sometimes a few other things, but that was the basic ingredients. He would coat the hearts in flour then fry them in fat or butter (whatever we had at the time) Then add the onions, peppers and garlic, fry at a medium heat until soft. Then add the stock or water or canned tomatoes for moisture and add a lot of paprika 1/4 cup/ish. Bring to boil and let simmer down until thickened and pour it over the dumplings. Dumplings were simply flour and water mixed until doughy consistency then scooped into a teaspoon and dropped into boiling water until they floated, about 5 or 10 minutes. You could add spices into the dumplings if desired or use some other type of starchy food such as potatoes or rice or noodles. I very much enjoy this quick easy dish and make it in a variety of different ways. Back when I was a child in the 70's we never had a lot of money so it was very affordable and healthy dish to make. It is still very affordable even today.